1.6" LCD screen with clear digital readout. Green backlight, push button to switch ON/OFF. Real time temperature display, ℃/℉ switchable. 10 minutes auto power off. Data recording function, up to 33 sets of data can be recorded. Soft black pouch for easy carrying and convenience storage. 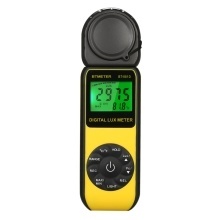 Functions including: Data hold, Backlight, Max./Min. hold, Relative value, Data storage, Temperature, Bar graph, Lux/FC selection.